platforms using the MQTT IoT protocol and JSON data formats. 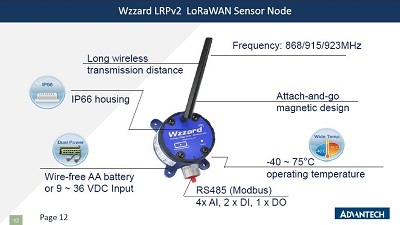 The Wzzard Intelligent Edge Nodes nodes accommodate virtually any industry standard external sensors. All 802.15.4e Wzzard Intelligent Edge Nodes contain an internal temperature sensor. The BB-WSD2XV0 node includes an integrated accelerometer and an external antenna.